All summer I've been enjoying bars of unique, sensuous, and completely addictive Hummingbird Chocolate and I always pick up a few bars from Drew and the mysterious Erica on Sundays at the Ottawa Farmers' Market in Brewer Park. In my household, they don't last long! 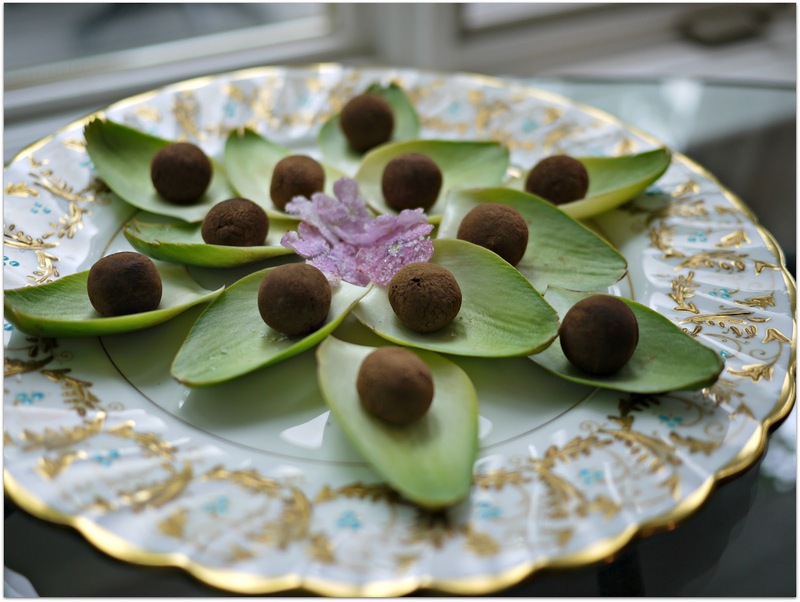 Wanting to share this new find with friends, I was transforming a few of their Hispaniola bars into chocolate truffles as the grand finale to a dinner party later in the day and I had a light bulb moment. Also on the menu was a salad made with some of Acorn Creek Farms' magnificent globe artichokes and while I was pulling off leaf after tough outer leaf to get to the delicate, edible centre, the modern day mantra of "reduce, reuse recycle" was running through my head. I was thinking about how that huge pile of artichoke leaves had a dim future on the compost heap when an idea struck. 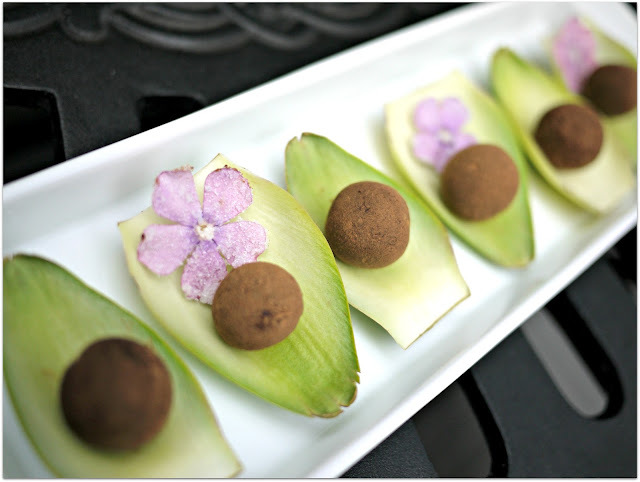 Why not use them as a base for the chocolate truffles? Out came my scissors and voila! In no time at all, I had a bowl full of practical truffle bases. Interestingly enough, turning Drew and Erica's chocolate into truffles intensified the fruity, intense flavours characteristic of some of their bars. Needless to say, the truffles were a big hit, especially after I served everyone some delicate Darjeeling tea. The conversation paused as the truffles melted in our tea-warmed mouths. This presentation worked really well at the dinner table and it would work well at cocktail parties too. As you pass the plates of truffles, guests can grab a leaf and pop a truffle into their mouths without getting their pinkies covered in cocoa powder. 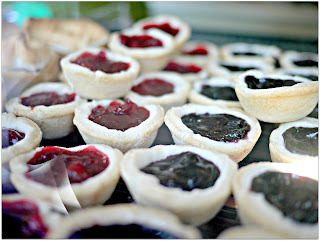 Just make sure you make a lot of them for your guest's happy, appreciative mouths! You won't need to add liqueur or butter to these truffles as most truffle recipes call for. 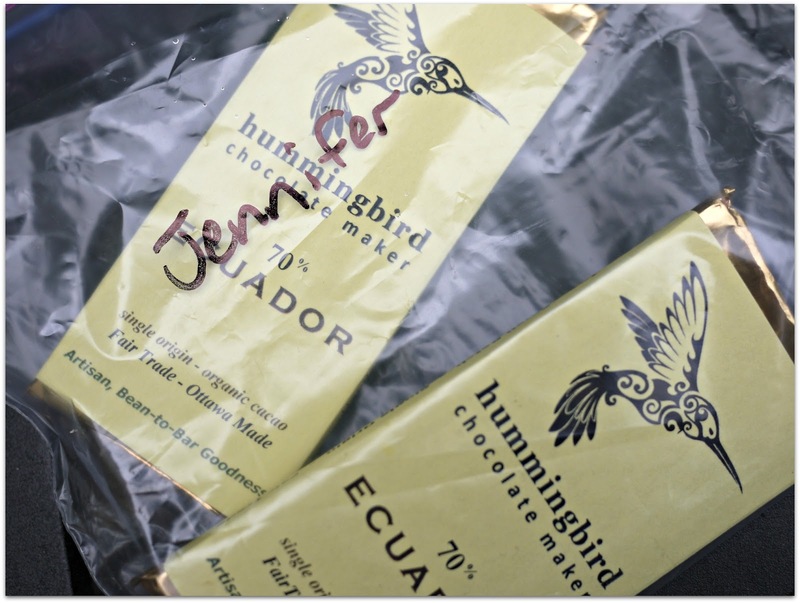 Hummingbird chocolate is complex and smooth enough to stand on its own. Don't mess with perfection! 1. Finely chop the chocolate and place in a medium bowl. The pieces should be smaller than blueberries. 2. 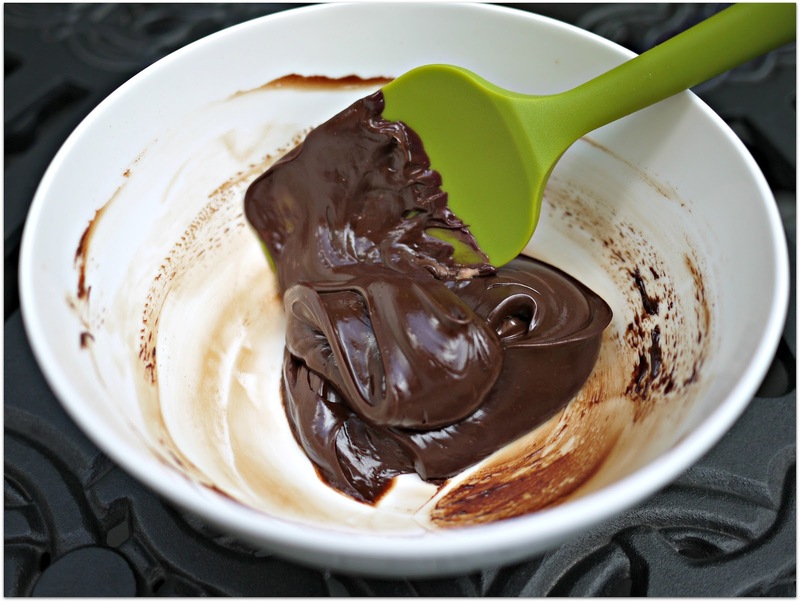 Heat the heavy cream in a saucepan or microwave and when it starts to boil, pour it over the chopped chocolate. Let it sit, undisturbed for 1 minute. 3. Create the ganache. Starting in the middle of the bowl, stir the cream and chocolate together vigorously in small circles, and then continue stirring outwards until the mixture is smooth. If you have pieces that are not melted, let the mixture sit for a minute or two. The heat of the cream should melt these pieces. If not, sit the bowl in a bit of hot water for a minute or two and stir again. Repeat this process if needed. 4. Cover the ganache with plastic pressed to the surface and let it sit, undisturbed for about 1 hour until it solidifies. It may take longer to firm up depending on the ambient temperature in your kitchen. If the mixture is taking too long to cool or you're pressed for time, place it in the refrigerator but only for a few minutes at a time, checking it and stirring it. If you're piping the ganache, you'll want to harden the mixture somewhat but leave it soft enough to pipe. If you're using a melon baller or spoon, you can keep it in the fridge until it hardens completely. 5. 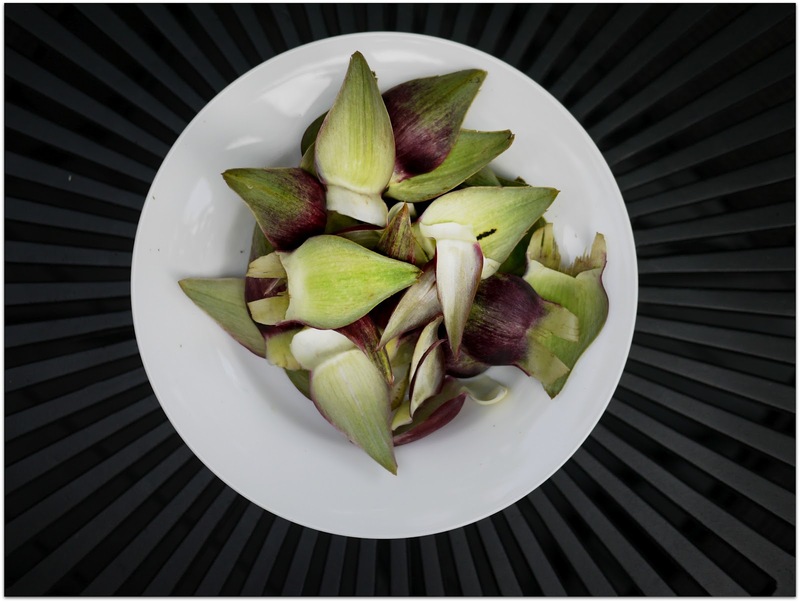 Either way, while you're waiting for the ganache to firm up, trim the bases of your artichoke leaves and arrange them on a serving plate. Sieve the cocoa powder into a bowl or plate. 6. Place the ganache into a piping bag and pipe rows of mounds onto your parchment lined baking sheet about the size of a large grape. If you're not using a piping bag, use your melon baller or small spoon to scoop the mixture into mounds. 7. Put the mounds in your fridge for a few minutes to firm up. 8. 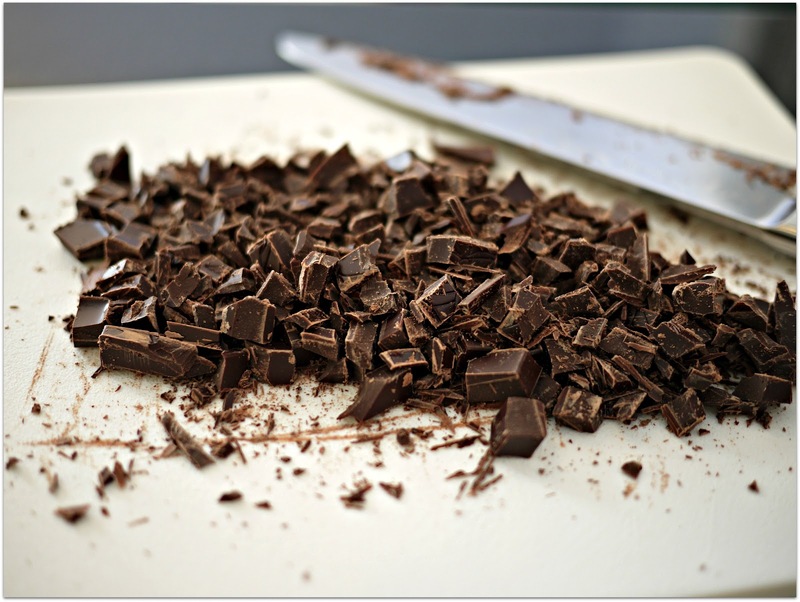 Drop the mounds, 3-4 at a time into the cocoa and make sure they are completely coated. Form each them into smooth, round balls by rolling them between your palms. Wearing gloves will help keep the balls from melting too quickly. As you form them into balls, gently drop them back into the cocoa, no more than 3-4 at a time. 9. Roll the balls around gently in the cocoa, making sure they're completely coated. 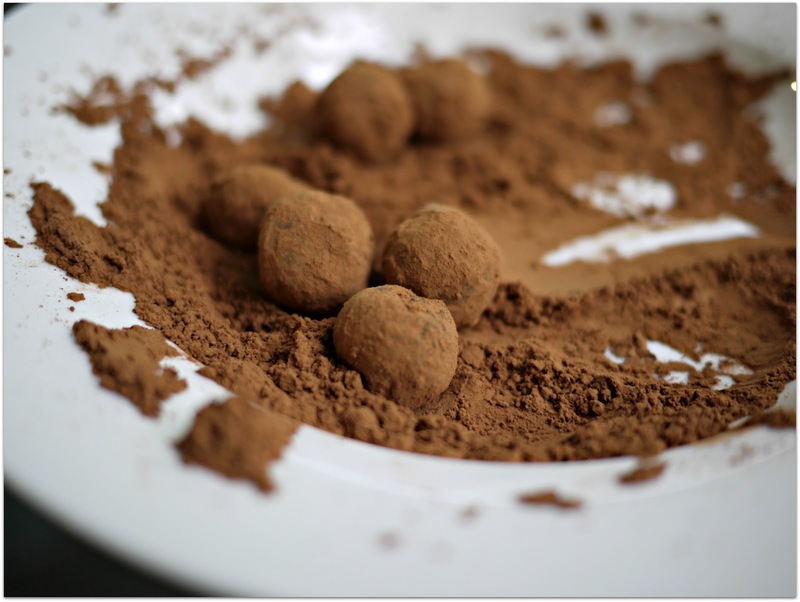 Use a spoon to transfer the balls into a fine meshed sieve and gently shake the sieve to remove some of the extra cocoa powder. 10. 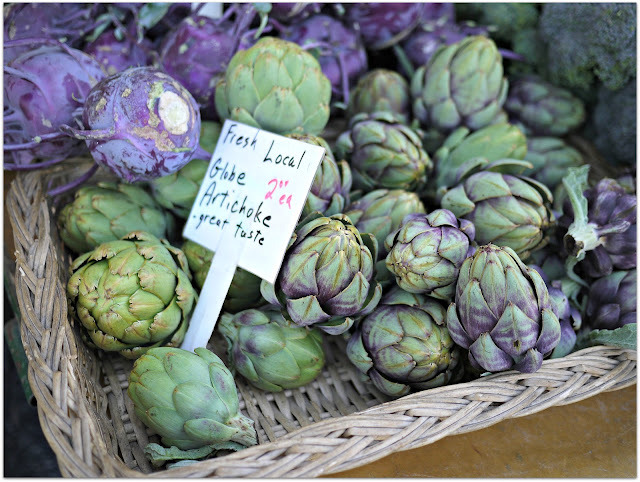 Place a truffle in each of the artichoke leaves or set the truffles aside, at cool room temperature or refrigerate if you wish until serving. If you do refrigerate your truffles, be sure to cover them well and let them temper at room temperature about 15 minutes before serving. 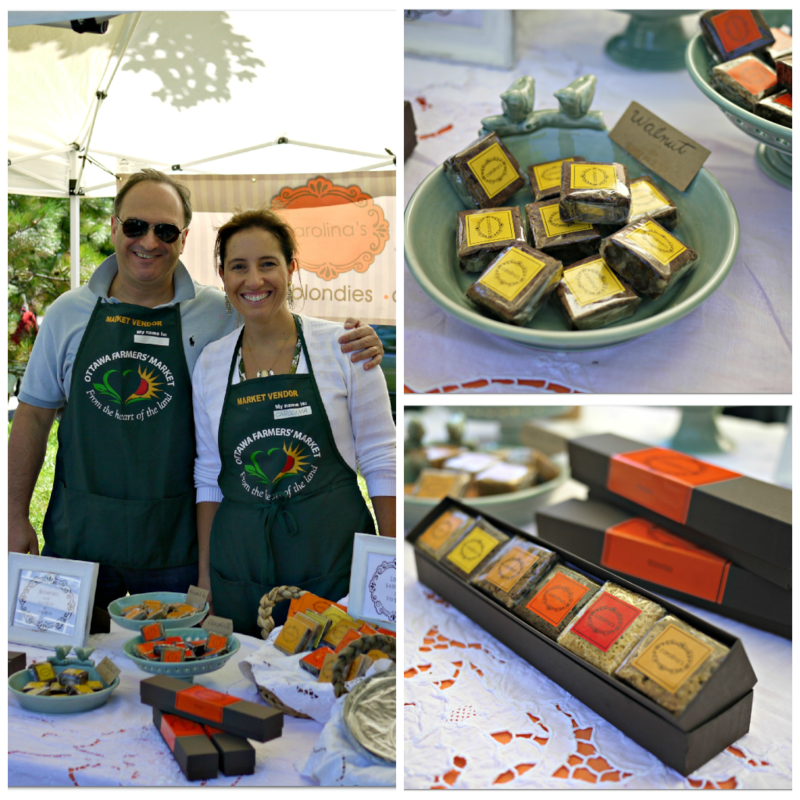 If you can't find Hummingbird chocolate bars, poor you, you'll get good results from other "bean to bar" chocolate such as SOMA or Olivia. 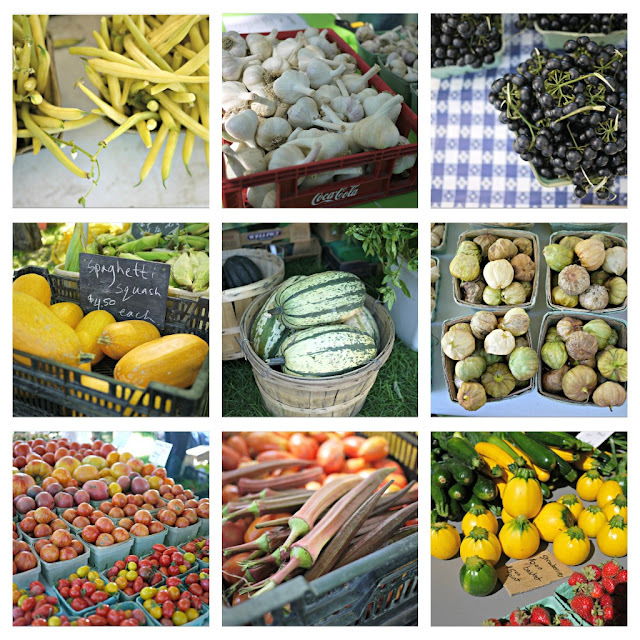 I've been feeling a bit like a favoured auntie this summer, being lucky enough to attend the births of two brand spanking new local Farmers' Markets during my annual visit to the old country. 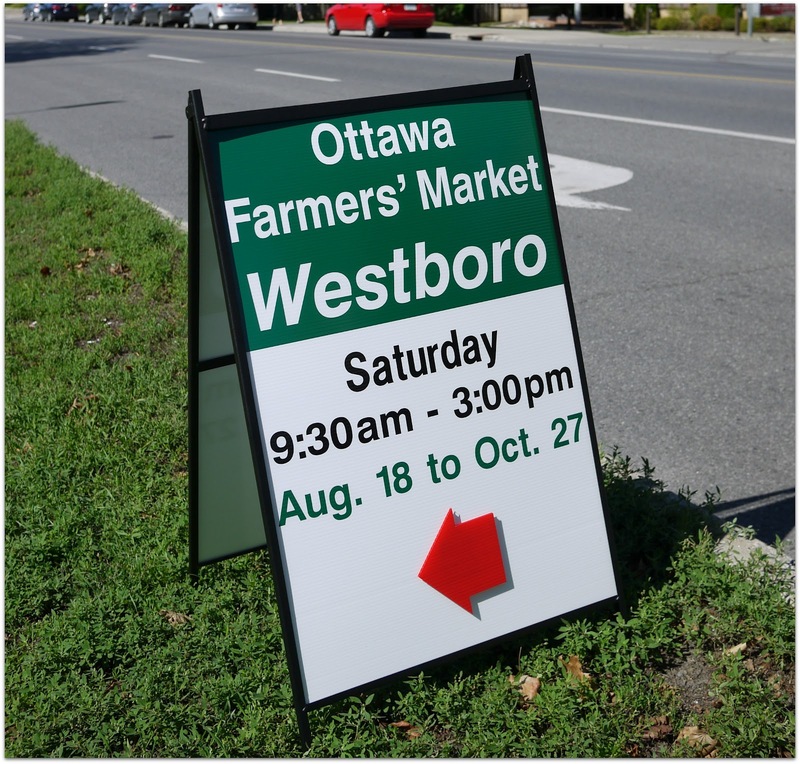 First, the Manotick Farmers' Market was relaunched back in June and today, the new Farmers' Market in Westboro made its stunning début. You couldn't have asked for a better day. The temperature was barely in the 20's, the air was clear, and the sky was a crystal blue. 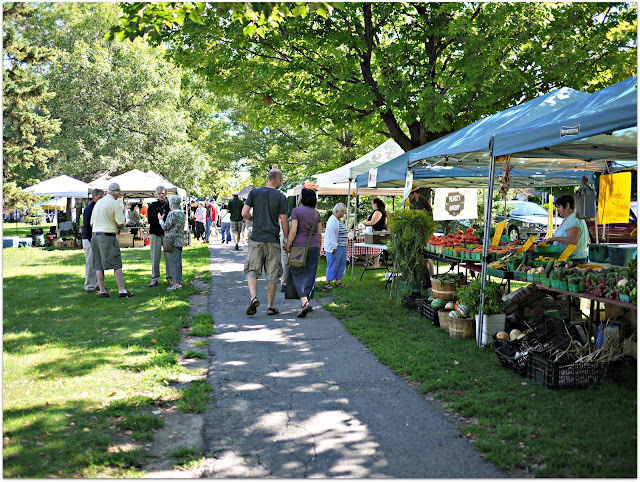 Shaded by a canopy of mature maple trees, about 30 vendors lined both sides of the long, straight side walk on the grassy boulevard between Richmond and Byron Avenues. This fall, it will be stunning to see the market surrounded by brilliant colours when all the leaves on all those maple trees start changing. Young and old were out and about and the Market was working its charm, creating a lively, spirited place for a community to gather and bond. 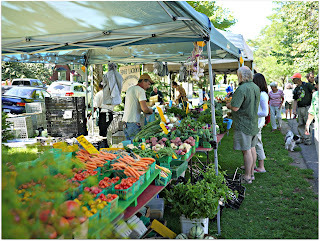 By 10AM, customers were thick and the general buzz in the crowd was that they were happy that at last, a Farmers' Market had finally arrived on their doorsteps. 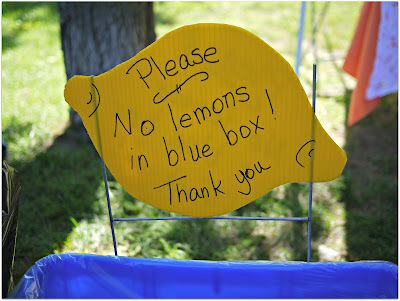 Based on the plentiful bags of goodies that people were carrying away with them, the vendors had reason to be happy too. Many of my favourite local vendors were there along with some new faces and based on today's positive reception, I expect more vendors will be joining them soon. 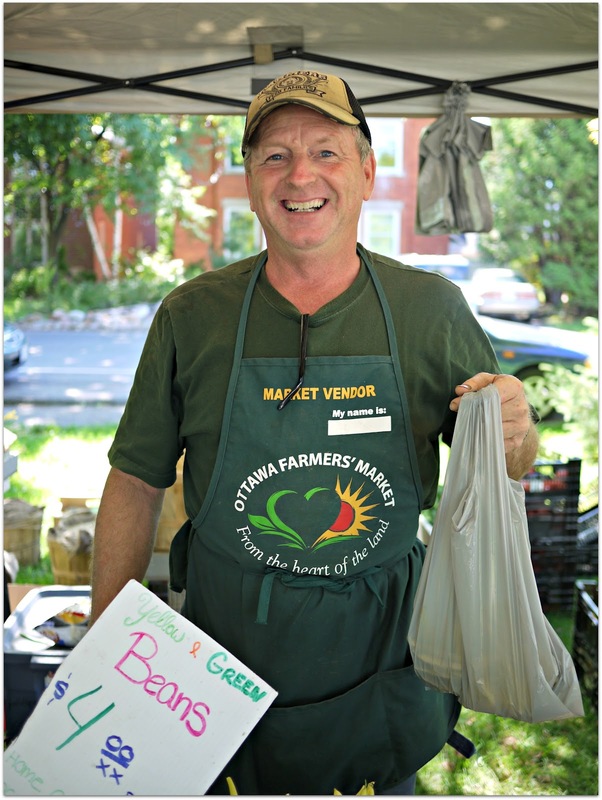 Congratulations to proud papa Robin Turner and the Ottawa Farmers' Market board, staff, and volunteers for a job well done. Let's hope there are many more additions to the happy family. 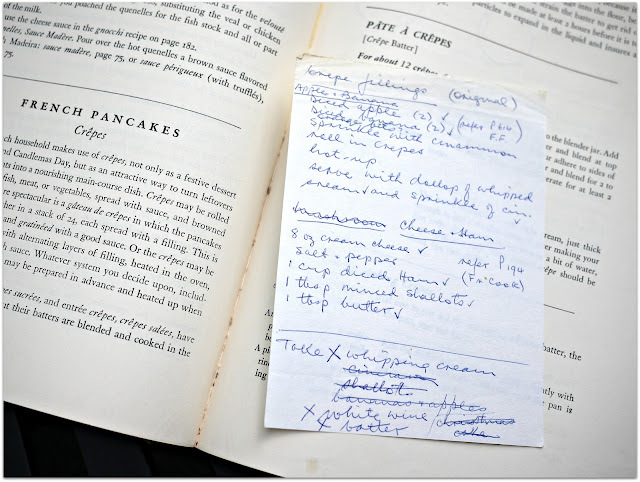 Julia Child, Luck, and Legacies. Five years ago on a rainy Saturday in May, I went to an estate sale in the west end of Ottawa. After setting aside a few goodies I'd found on the main floor, mostly cake stands and glassware, I ventured down to the basement for a look see. 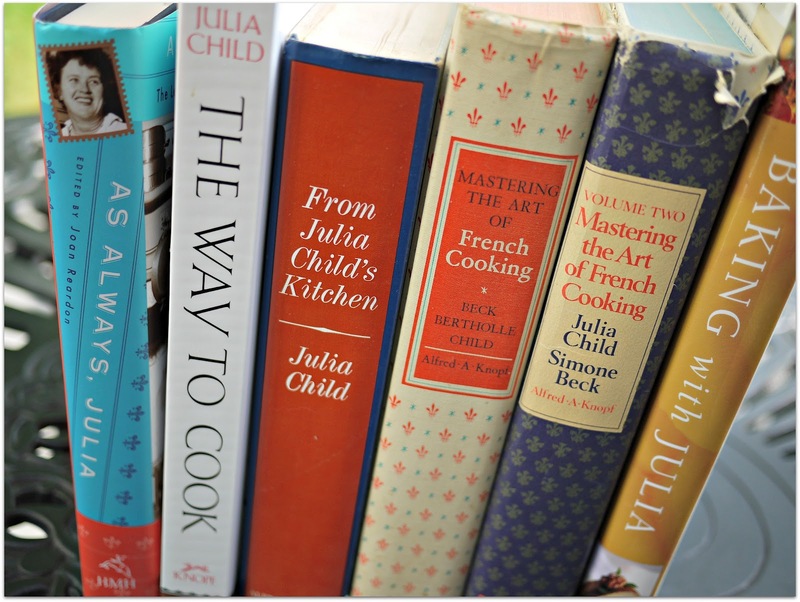 With my obsession for anything having to do with both cooking, and vintage, I'd always been a fan of Julia Child's classic TV show, The French Chef. I baked frequently from her collaborative cookbook, Baking with Julia so acquiring The Art of French Cooking was a summer mission of mine. I carefully pulled the book from the shelf. It was in pristine condition, as though it had never seen a kitchen. I leafed through it for a few minutes and when I realized that it was printed in 1963 my heart started racing. It was a fourth printing, first edition copy. I sought out the estate sale's host and asked him how much the book was. He replied, "how about $5?" My expression must have come across to him as sticker shock because then he followed with, "OK, how about $3?" I gave him $5, snuggled the book to my chest and ran, forgetting all about the other goodies I'd set aside on the first floor! Later that summer, I was at the Stittsville Flea Market and as luck would have it, I spotted a first edition copy of Volume 2. That cost me $5 too. So a meagre ten dollars later, I had a pristine copy of volume one and two and my mission to explore them was afoot! Over the summer, I spent hours reading both books. By August I had mastered Vichy Carrots, Spinach Quiche, Souflée and Pâte à Choux while slowly gaining an understanding of what an enormous effort it must have been to take French recipes and translate them not only literally but culturally, for, in Mrs Child's words, "...the servantless American cook." I can't begin to imagine the logistics of completing such an enormous project during the 1950s and 1960s, by snail mail, back and forth, from country to country, to and from her collaborators. Thank you Mrs Child for your determination and your courageous, unparalleled and inspiring work. I just hope that when I pass away and if someone disposes of my worldly goods in an estate sale, they charge more for my copies of Mastering the Art of French Cooking. Just to be sure, I'd better go put notes in them. 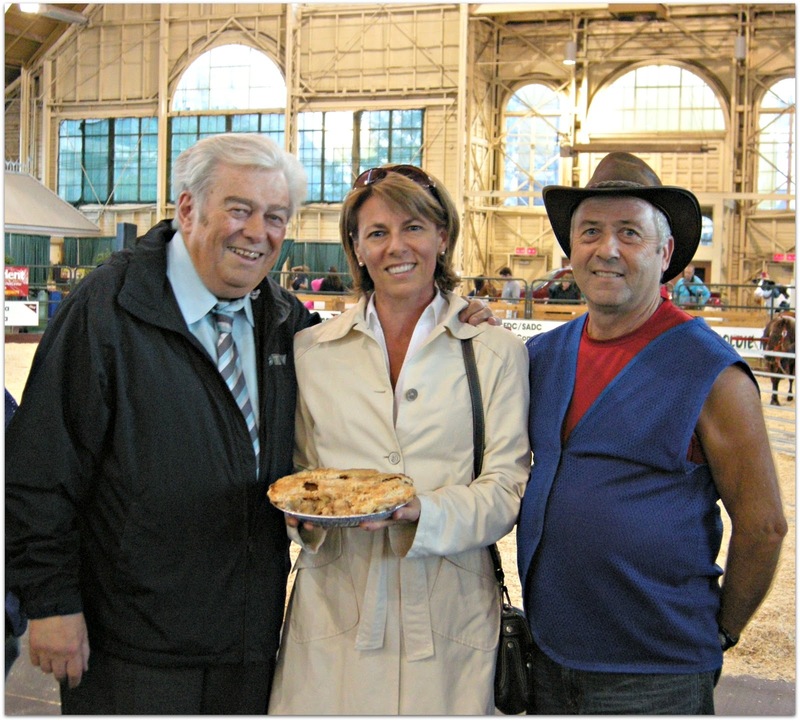 When the Central Canada Exhibition closed its doors at Lansdowne Park in Ottawa after 122 fun-filled years, we lost an important local culinary tradition that you probably didn't know about. And no, I don't mean candy floss and Tiny Tom Doughnuts. It was the Culinary Arts Competition. If you've ever walked through the Cattle Castle in Ottawa during SuperEx, or a covered building in any county fair, (usually the one without the animals) you may have noticed display cases filled with cakes, pies and cookies with ribbons attached and people milling about, licking their chops and pointing. This, my fellow city slickers, is the Culinary Arts Competition. For more than a century, rural women have been showing their prowess in the kitchen by entering this enduring competition, vying for coveted ribbons in the many sweet and savoury categories. With prizes for everything from chocolate chip cookies to dill pickles, there's a category to match every skill level and age range. Sadly, over the past few years, I've noticed that entries are dwindling and the competition has lost a bit of its caché. Years ago, baking, making preserves, and feeding your family was done out of necessity and garnered a source of family pride. These days you're more likely to drive to the supermarket, not descend into the cold cellar for a jar of jam or pickles. Me taking 2nd Prize in the 2010 SuperEx Apple Pie Contest and Fundraiser. Left, Max Keeping, right, the successful bidder for my pie! But take heart! Some local Fairs still value a well executed pie or cake. 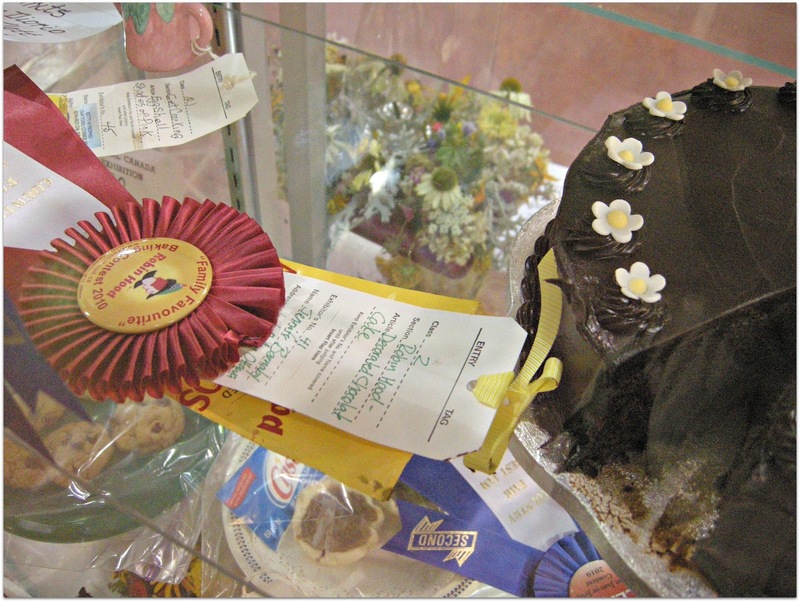 In the Navan Fair's Culinary Arts Competition, for example, you can become the Baking Queen and Princess. Baking Queen Dominique Deschamps and Princess Julie Charlebois were the winners of winners of last year's competition. Along with the admiration of their peers, they got to wear a nifty sash and ride around in a horse drawn carriage and wave at people. 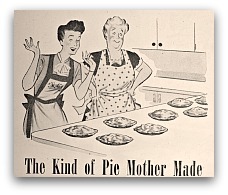 Personally, I nominate Mrs Ivyl Tarbell of Iowa as America's unsurpassed baking champion and ribbon mega winner. My meagre accomplishments are nothing compared to hers. I first learned of Mrs Tarbell and her unparalleled achievements in the 1965 edition of McCall's Magazine. 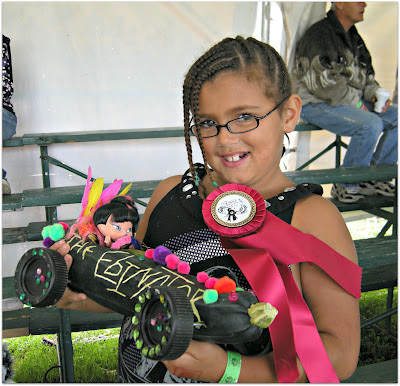 In the ad, she was smiling, surrounded by hundreds of her ribbons, many of which she'd earned from the granddaddy of all Culinary throw downs, the über competitive, Iowa State Fair. I felt compelled to phone Mrs Tarbell when I learned that in April, she was a finalist in the Iowa Egg Council’s 27th Annual Cooking Contest. I wanted to let her know how much I admired her and her accomplishments. Not surprisingly, she was as gracious and calm as could be despite the fact that she was dog sitting, using call waiting and helping her daughter with her entries in the Iowa State Fair. She should earn a ribbon for multi tasking. Mrs Tarbell began participating in culinary competitions as a young girl, using many of her grandmother's recipes and modifying them for the modern palate. Along with the accolades comes a lot of loot: the prize money in this years Iowa State Fair Culinary Arts category is a pinch over $64,000. The first prize for the cinnamon roll competition alone is $5,000. Needless to say, there's no shortage of competitors. 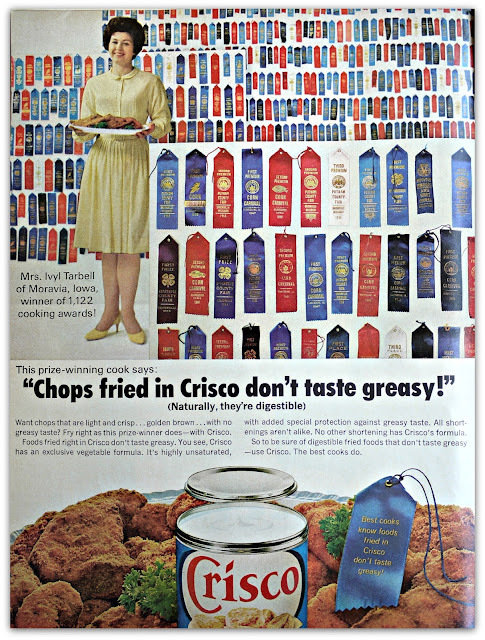 Mrs Tarbell began entering cooking competitions with the encouragement and support of her grandmother and mother with her mother earning over 5,000 ribbons throughout her life time. Mrs Tarbell's daughter Robin and her granddaughter Molly are following in the family's illustrious footsteps establishing the Tarbell women as an unstoppable 5th generation ribbon winning dynasty. Incidentally, she shared with me that her favourite things to make are cookies and candy. I am in awe of her abilities and modesty. 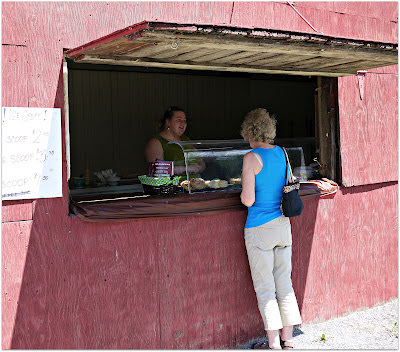 Closer to home, in May, I met Alyssa Toshack selling her delicious home baked goodies at the new Almonte Flea Market. She's a consistent ribbon winner at the Almonte Fair and her Babycakes Bakery is doing a brisk business. If you'd like to start your own culinary dynasty or just want to give it a go for fun, here's how the competitions work. 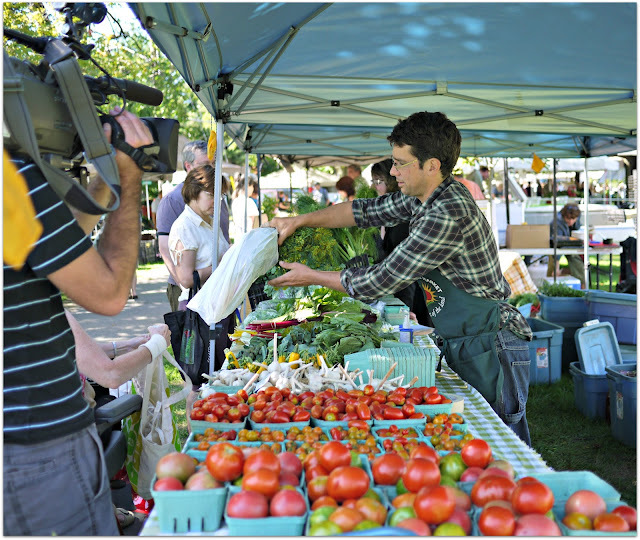 First, for a small fee, you need to become a member of the Agricultural Society governing the region's fair. Second, you need to register for the competition and choose which categories you'd like to enter. Along with the Fair sponsored entries, manufacturers of baking and preserving products like Tenderflake, Certo, Robin Hood and Bernardin sponsor categories in which their products must be used. 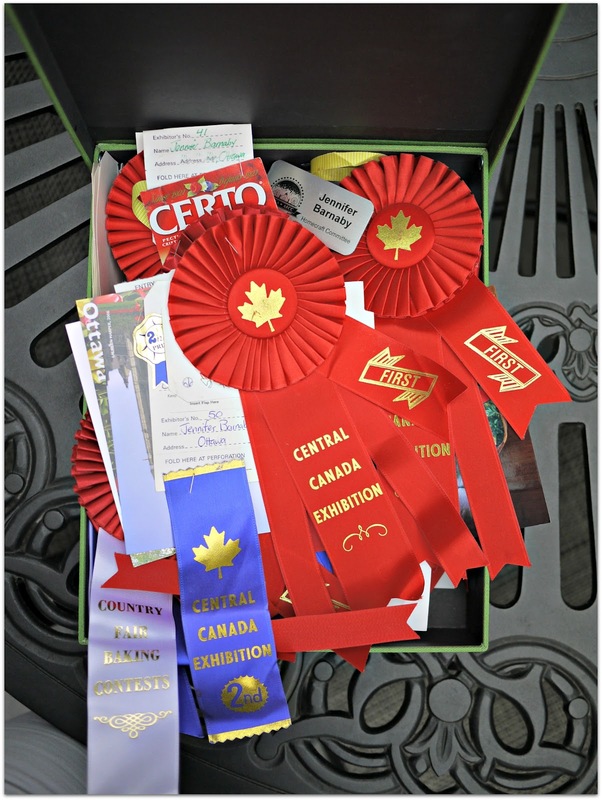 The prizes they offer are often quite generous with special gift certificates and coupons to buy their products. If you think your grape jelly or chocolate chip cookies are any good, trust me, the judges in these competitions will tell you the truth and set you straight! Members of the Homecraft Committee, or the Womens' Institute are a wise, skilled group of women who take their judging seriously Just remember: the rules are strict. You should follow them to the letter to avoid disqualification. If you like to bake, why not enter some of the categories yourself and start your own culinary tradition? Luckily there are still a few country fairs in nearby towns that still offer Culinary Arts Competitions. Who knows? You may become Canada's next Mrs Tarbell! Navan Fair Culinary Arts Competition Almost 100 baking and sweets categories to test your abilities. Carp Fair HomeCraft/Womens' Institute Entries for this year's fair are closed but you can still visit the exhibits during the fair. Richmond Fair About 75 baking categories including many for children, and a wine and beer making competition. Metcalfe Fair Sixty-five categories of baking plus preserves, wine and beer and some quite generous payouts and prizes for the winning entries. If pie is your speciality, and you want to win big, you should enter Port Elgin's Annual Pumpkin Fest Pumpkin Pie Competition where the top prize in the Pumpkin Pie category is $100. The contest isn't until September so you have a month to practice your pumpkin pie recipe. The Almonte Fair, now in its 154th year, offers about 70 awards including many for children 7-18. You should also visit The Ontario Fairs website for a complete listing of Fairs and baking competitions throughout Ontario.